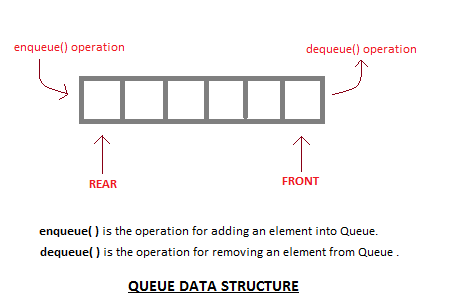 Queue is also an abstract data type or a linear data structure, just like stack data structure, in which the first element is inserted from one end called the REAR(also called tail), and the removal of existing element takes place from the other end called as FRONT(also called head). This makes queue as FIFO(First in First Out) data structure, which means that element inserted first will be removed first. Which is exactly how queue system works in real world. If you go to a ticket counter to buy movie tickets, and are first in the queue, then you will be the first one to get the tickets. Right? Same is the case with Queue data structure. Data inserted first, will leave the queue first. Like stack, queue is also an ordered list of elements of similar data types. Queue is a FIFO( First in First Out ) structure. Once a new element is inserted into the Queue, all the elements inserted before the new element in the queue must be removed, to remove the new element. peek( ) function is oftenly used to return the value of first element without dequeuing it. Serving requests on a single shared resource, like a printer, CPU task scheduling etc. In real life scenario, Call Center phone systems uses Queues to hold people calling them in an order, until a service representative is free. Handling of interrupts in real-time systems. The interrupts are handled in the same order as they arrive i.e First come first served. Queue can be implemented using an Array, Stack or Linked List. The easiest way of implementing a queue is by using an Array. Initially the head(FRONT) and the tail(REAR) of the queue points at the first index of the array (starting the index of array from 0). As we add elements to the queue, the tail keeps on moving ahead, always pointing to the position where the next element will be inserted, while the head remains at the first index. 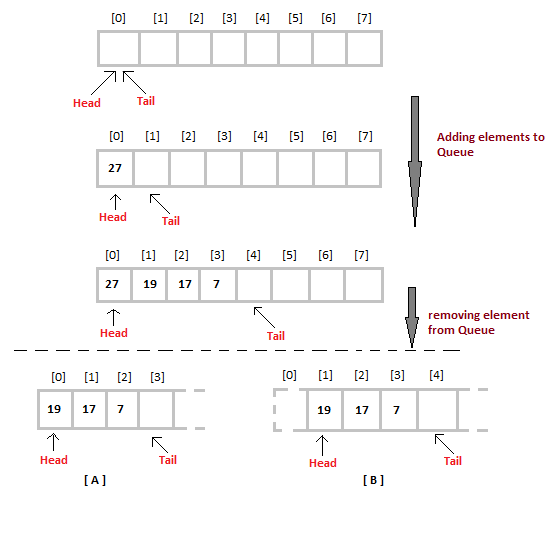 When we remove an element from Queue, we can follow two possible approaches (mentioned [A] and [B] in above diagram). In [A] approach, we remove the element at head position, and then one by one shift all the other elements in forward position. In approach [B] we remove the element from head position and then move head to the next position. In approach [A] there is an overhead of shifting the elements one position forward every time we remove the first element. In approach [B] there is no such overhead, but whenever we move head one position ahead, after removal of first element, the size on Queue is reduced by one space each time. Check if the queue is full or not. If the queue is full, then print overflow error and exit the program. If the queue is not full, then increment the tail and add the element. Check if the queue is empty or not. If the queue is empty, then print underflow error and exit the program. If the queue is not empty, then print the element at the head and increment the head. To implement approach [A], you simply need to change the dequeue method, and include a for loop which will shift all the remaining elements by one position. Just like Stack, in case of a Queue too, we know exactly, on which position new element will be added and from where an element will be removed, hence both these operations requires a single step.